Mario has been dreaming of a land hidden at the top of a staircase behind a mysterious door. The next day, Mario and friends go on a picnic. They find the very same door that appeared in Mario's dream, and behind it lay the land of Sub-Con, conquered by Wart using the Dream Machine. Mario, Luigi, Peach and Toad set off to save the dream land. Before each level, choose between Mario, Luigi, Peach and Toad, each with their own strengths and abilities. Cross the seven worlds of Sub-Con, grabbing and throwing enemies, items and vegetables on your way to the goal. Find out more about the characters, enemies and items you will meet in the Dream Land of Subcon. 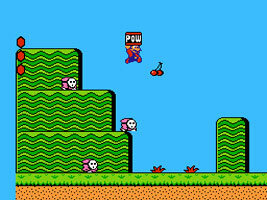 Find out more about the hidden secrets found in Super Mario Bros. 2.